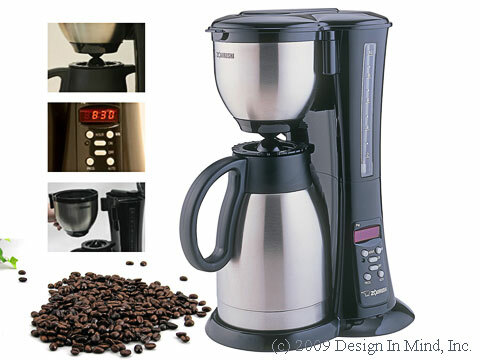 Recommended coffee makers deliver the most from great coffee! Our choice for the best available automatic coffee making equipment has to consistently deliver water at the right temperature and for the right period of time to release the best your coffee has to offer. Also, the product should keep the coffee hot without continuing to cook the coffee. This is the one coffee maker we have chosen to carry. The unique feature of this coffee maker is an insulated filter basket. Though the wattage is low (1200 watts) the extra insulation increases the brewing temperature to maximize flavor extraction. The Zojirushi Fresh Brew brews directly into the thermal carafe giving your coffee that just-made flavor and aroma for hours. FREE: 12 oz. drip grind regular Jen's Java coffee included with your order. Fresh roasted daily. 10-cup thermal carafe keeps coffee hot for hours. Carafe lid is designed to stay on during brewing with a small cap to keep heat in when it's ready. 10 1/2"W x 8 1/2"D x 15 1/4"H.
Clean exterior with soft damp cloth.